In the final years of the 19th century, the vast plot of la Fraineuse was bought by a wealthy family of Verviers’ industrial businessmen, in order to build the Château de la Fraineuse. Later, in 1947, the city of Spa acquires the domain with the ambition to create a leisure centre. Following the open course of history, in 2016 the site of La Fraineuse benefits from infrastructural renovations in its mains buildings as well as a new extension. This new castel addition ties its roots to one of the landscape’s fundamental qualities: the presence of an important topography which allows to physically inscribe the building into the territory. Developed as a single-storey building, the structure aims to assume both a limited presence and a strong coherent identity as part of the existing site. Either through the volumetric relationships established with its surroundings, or the multiplicity of ways and accesses it proposes, its design follows a logic that, being intimately attentive to its context, aims to be more complex than that of a single object. 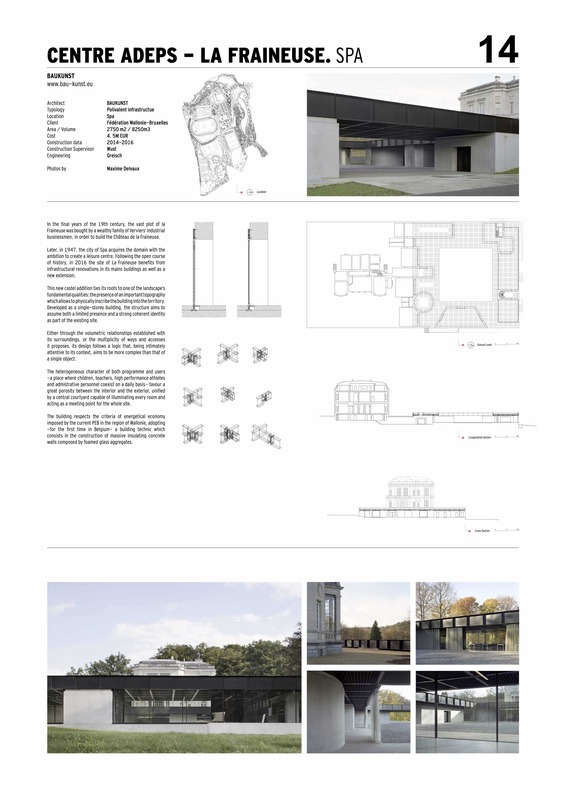 The heterogeneous character of both programme and users -a place where children, teachers, high performance athletes and admistrative personnel coexist on a daily basis- favour a great porosity between the interior and the exterior, unified by a central courtyard capable of illuminating every room and acting as a meeting point for the whole site. The building respects the criteria of energetical economy imposed by the current PEB in the region of Wallonie, adopting -for the first time in Belgium- a building technic which consists in the construction of massive insulating concrete walls composed by foamed glass aggregates.